"JustHost" Reviews (Apr 2019) - Why 3.7 Stars? JustHost has a great array of features, especially in the shared hosting space. With lots of free extras added, such as unlimited storage, email accounts, and data transfer, plus a domain name registration, it is a great value for the money. As an added benefit, 1-click installations for hundreds of open-source apps are available through their Mojo Marketplace. “JustHost has a lot of free extras that come with their services, making them a good, moderately-priced shared host. Their website is easy to use and clean. Their web administration panel is designed in the same vein and it makes using JustHost a pleasure when compared to some of the other hosts that have more complicated administration panels. “A lot of freebies come along with JustHost, making it a great value. The starter plan is very affordable; however the best deals are saved for those that sign up for multiple years. “JustHost's modern hardware and a lot of dedicated IP addresses are the centerpieces of its dedicated offerings. Each server is fully-managed with enhanced cPanel, making JustHost a good choice for a first-time user's dedicated server. Experienced users who want to manage or configure all aspects of their servers may look to another host. “JustHost is a mid-tier web host that has somewhat pricey VPS options given the amount of processing power that you get. With that said, their interface is extremely simple to navigate and their live chat and phone support team is very quick to respond. Ryan Frankel (HostingAdvice.com): This rating is not available yet. We haven't evaluated JustHost for the "WordPress" option yet as they do not currently offer this type of hosting service. We're always working to keep our reviews up-to-date so check back later! Does JustHost already offer the "WordPress" option? Let us know. “With JustHost, their website building options are included in their shared hosting. While not as robust as a Weebly-based drag-and-drop system, they include 400 templates, which should satisfy even the pickiest of users. $50-worth of free Facebook credits, $100-worth of free Google Adwords credits, and $50-worth of free Bing credits. Unlimited storage, unlimited email accounts, and a free domain are all included with shared hosting. Free site builders allow true beginners to get a site up and running very easily. 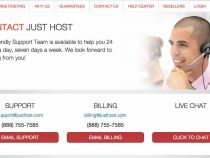 JustHost specializes in customer satisfaction and they provide 24/7 phone, chat, and email support. Their control panel interface uses cPanel as the base and is included in the price. The hosting features are tightly coupled with the customer control panel, which makes it simple and fast to set up your site. With every JustHost account they include access to their entire script library. Download and install popular applications — everything from simple additions like forums (e.g., phpBB) to eCommerce shops like osCommerce. 1-click installations for the Web's most popular open-source software, such as WordPress, are very popular on JustHost as well. It is refreshing to see a host that takes pride in being clear to their customers, rather than setting an expectation that they can't achieve. What specifically sets JustHost apart can be seen on the Why Us page of their website. Boasting their uptime rates and the unlimited domain support they offer, they adamantly support their case for why you should choose JustHost to host your next web project. It is obvious from JustHost's website that they focus on treating their customers well. The site is simple to navigate and highlights their phone number and live chat. JustHost has good pricing for the longer-term plans and gets more expensive for the shorter terms. Due to their anytime refund, it's worth purchasing one of the longer-term options and just getting a refund if you decide your hosting needs are different in the future. JustHost is a bit newer to the hosting game being founded in 2008. They still have an excellent reputation in the industry and their focus on customer support is admirable. Wondering how JustHost stacks up againt other web hosting services? See our host-vs-host reviews below and compare them side by side. If you are looking to sign up for a plan for more than one year, and you are new to the web hosting space and will therefore require a lot of support, JustHost is a viable option. They give their customers room to grow as well with their dedicated server and VPS options.